The digital garment printing industry is expected to skyrocket to $12.8 billion by 2010. It is a fast growing part of the $44 billion garment decoration industry. 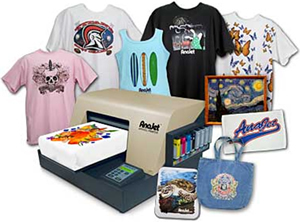 Print and sell customized promotional products with an AnaJet Digital Printer! Garment decoration is recession proof, according to industry surveys and experts. You can start generating income as soon as you start printing! Some customer sold 4,500 shirts in their first two months – that's over $60,000 worth of business! You determine how much you want to make! With a production cost averaging about $1.75, and the average t-shirt selling for upwards of $20, you can imagine what your profit could be! T-shirt Printing – A Recession-Proof Business!! You'll get all the support you need from AnaJet, the undisputed leader in the digital printing industry! AnaJet's top notch tech support team is here to serve you! We provide complete, comprehensive training that will give you the comfort and confidence you need to successfully run your business! AnaJet support is available around the clock when you have questions - via phone, email, web seminars, videos, and discussion boards with other AnaJet owners! We wrote the book on the industry!!!! The T-shirt Revolution: Building Your Business Using a Digital Apparel Printer was written by our CEO Dr. Chase Roh and Vice President Mr. David LaVita. Everything you need to know about running your own digital printing business is inside! From production to marketing to setting up your website, there is no other source for such complete information on this profitable industry. Available at Amazon.com, bookstores and libraries everywhere! Get into a business that is fun, creative, and PROFITABLE!!! AL, AZ, AR, CA, CO, GA, HI, ID, IA, KS, ME, MA, MI, MS, MO, NV, NJ, NH, NY, ND, OH, OR, PA, TN, WI and WY. 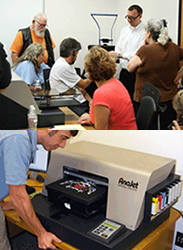 Click on Request Information for FREE info on how to open a AnaJet Garment Printer franchise today! Please Note: This AnaJet Garment Printer franchise opportunity and other franchise business opportunities, businesses and franchises for sale on this web site are not to be considered as an "offering", "franchise offering", suggestion or recommendation by Franchise Leader™. This advertisement depends entirely on the truthfulness of the information provided by our advertisers which includes, but is not limited to, franchisers, franchise brokers, franchise consultants and business brokers. Franchise Leader™ recommends that you consult a lawyer, financial consultant, accountant or professional advisor before buying a franchise or business opportunity or any type of business. By using this form or any part of our website, you have agreed to all terms and conditions of Franchise Leader™. Please review our Terms & Conditions for more information.